Around this time of year, I find my refrigerator overflowing with random veggies that looked too beautiful to pass up when perusing the farmers’ market. Do you ever wonder how people learned how to cook all of these different things before the internet? I do. I picked up this lovely tricolor cauliflower and wondered how it might fare on the grill. The answer is very well! It caramelizes nicely and absorbs the smokey flavor, making this sometimes-bland vegetable very tasty and interesting. I used this recipe from HuffPo, but I bet there’s any number of great flavor combinations you could try! 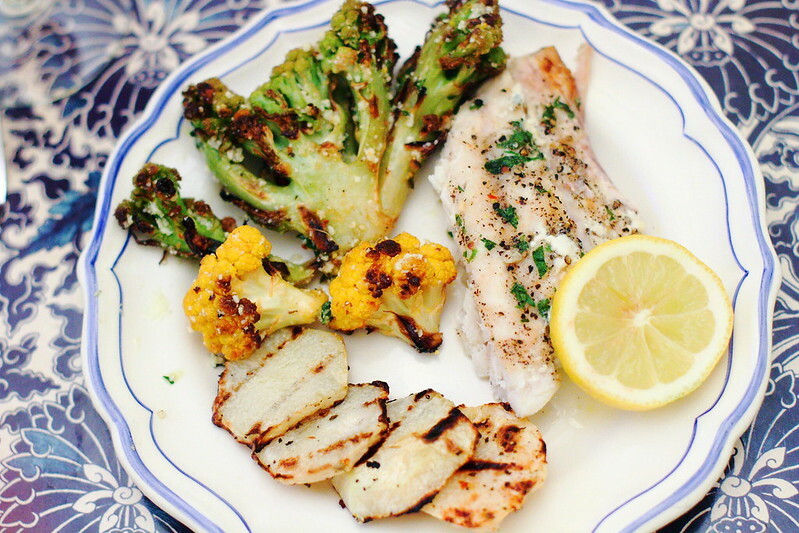 I served the cauliflower with grilled grouper that was very simply marinated in olive oil, Greek herbs (Greek basil, Greek oregano, and marjoram) a little bit of lemon juice and lemon zest and salt and pepper. Also added a slices of grilled kohlrabi on the side! Remove outer green leaves from cauliflower. Slice into ¾-inch thick slice “steaks,” cutting from top of head to bottom of stalk. Arrange steaks on a baking sheet or large plate. Whisk together oil, lemon juice, basil and oregano in a small bowl until smooth; season with salt and pepper. Brush mixture liberally on both sides of cauliflower to coat, reserving extra marinade. 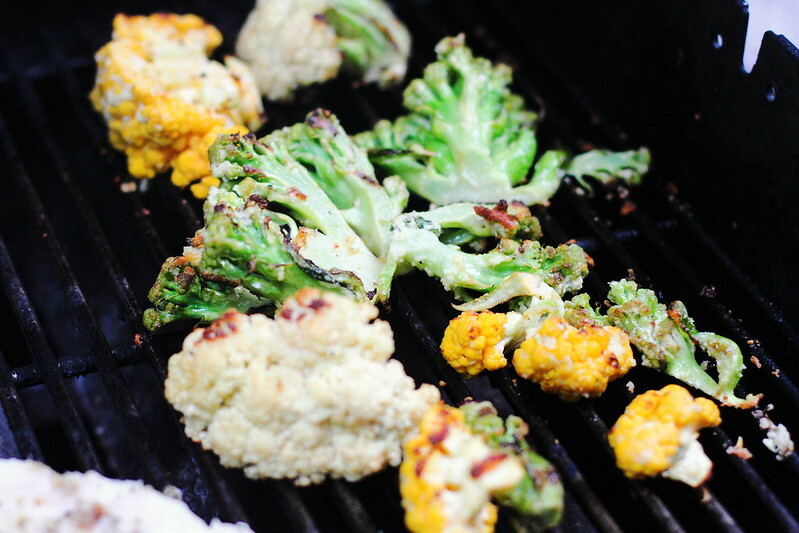 Arrange cauliflower on preheated grill. Cover and cook until browned on one side; turn over and cook until other side is browned, about 10 minutes in total. When flipping cauliflower, brush with reserved marinade. Sprinkle tops of cauliflower liberally with half of the cheese; cover and cook until melted. Turn cauliflower over; repeat with remaining cheese. Serve with grilled grouper and kohlrabi and enjoy! This looks like such a light, bright and tasty summer meal. Plus anything you can cook on the grill gets a green light in this household during the summer. Ohh nice post, looks super yummy!